You can record or upload video and audio files as part of your Conversations messages. Note: Attachments appear in your user files in the Conversation Attachments folder and count against the files limit for your account. 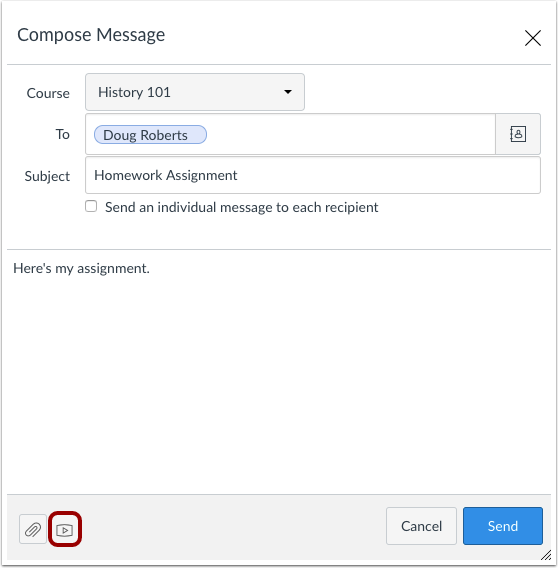 To start a new message, click the Compose icon. To attach a media comment or file, click the Media icon. A pop-up window will appear in your browser. Note: If you see a message from Adobe Flash Player and instructure.com requesting access, click the Allow button. Click the Record Media tab . Select your preferred media method: record with webcam  or record with microphone only . In the title field, name your media comment . 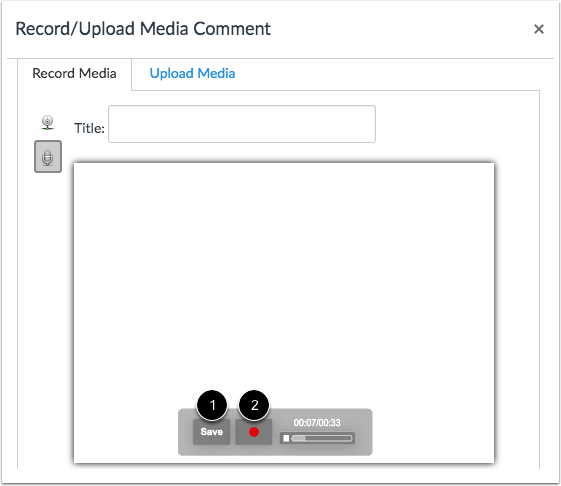 When you're ready to record, click anywhere within the media comment to start recording . The timer with the red dot  will indicate you are recording your media comment, as well as the length of the comment. 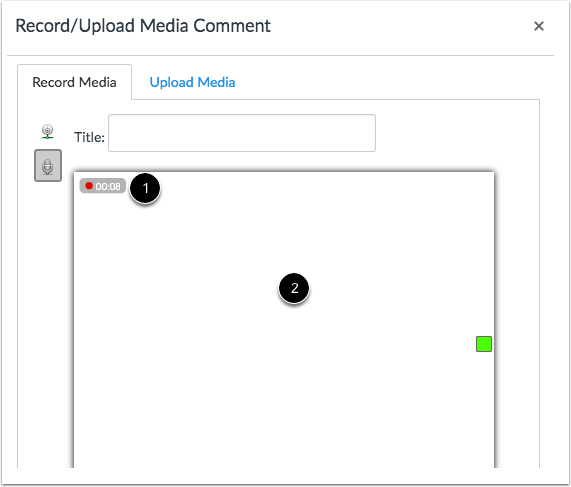 Once you are finished recording, click anywhere within the media comment to stop the recording . Before you attach the media comment, you have the chance to review it. If you are happy with the result, click the Save button . If you want to re-record the recording, click the Record button  to start over. 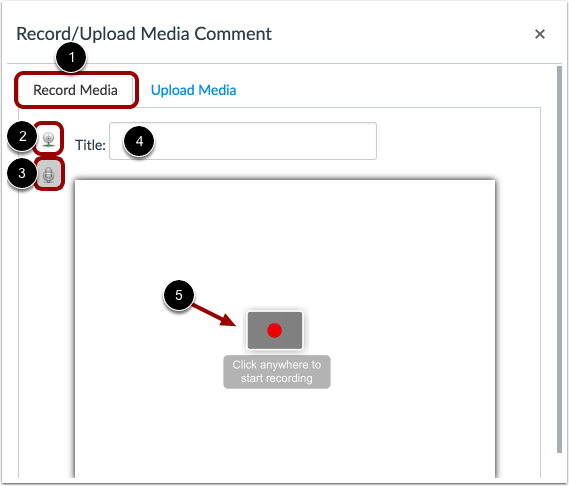 If you have a previously recorded media file, you can upload it as part of your message. Click the Upload Media tab . Click either the Select Audio File button  or Select Video File button . Locate the media file on your computer. Click the Open button. Your media comment will appear in your message . If you want to remove the comment, click the delete icon  to remove it from the message. When you are finished, click the Send button . The media comment will appear below the message. Click the link to view the file. 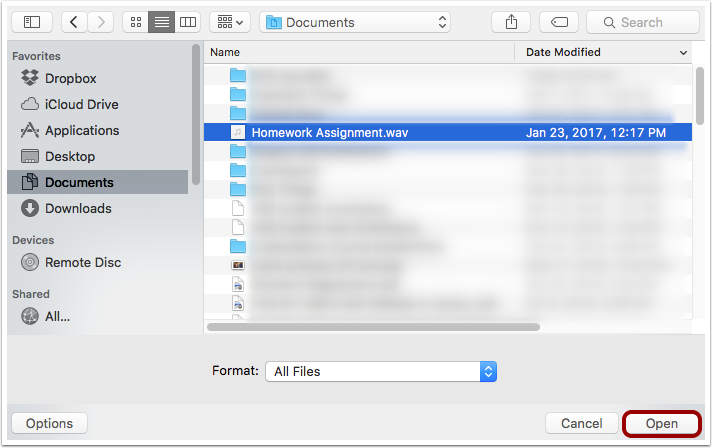 Previous Topic:How do I attach a file to a message as a student? Next Topic:How do I reply to a message in Conversations as a student? 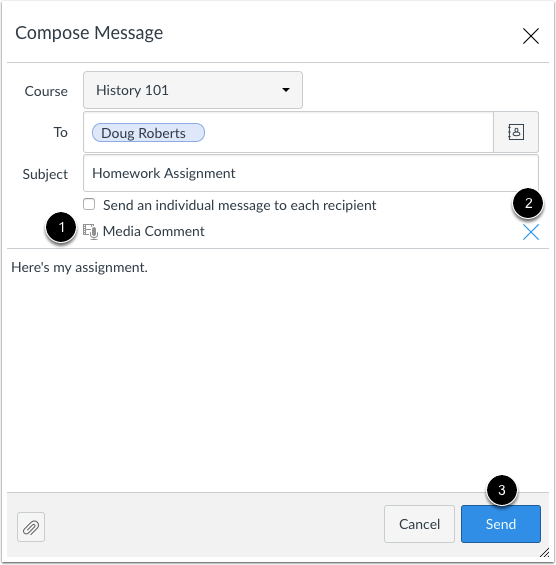 Table of Contents > Conversations > How do I attach a media comment to a message as a student? Re: Students unable to send media files. Re: How do I insert an image into a conversation post?